Retired Lt. Col. Gary Rudman, the U.S. Air Forces Central Command Safety deputy director, performs safety duties at Shaw Air Force Base, S.C., Jan. 9, 2017. Rudman applies safety measures throughout the USAFCENT area of responsibility to prevent personnel and equipment mishaps. 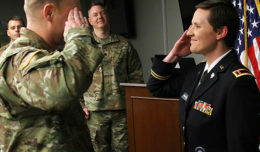 Rudman retired from the Air Force May 1, 2011, as the USAFCENT Safety director and continued his service as a civilian at Shaw Air Force Base, S.C. He said he sought additional consultation in May 2014, from a pain management doctor when the pain in his back didn’t lessen. 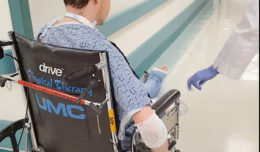 That doctor thought an object could be pushing against his nerves near the piriformis muscle, and when an MRI was ordered, it showed an inoperable, softball-sized tumor in his pelvic region. Rudman was prescribed 28 day monthly cycles of chemotherapy pills, a monthly steroid pill and a Velcade shot which is used to treat this type of cancer. 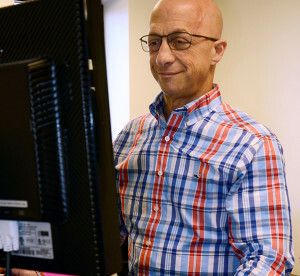 There were days when he said the chemotherapy zapped his strength, but through sheer determination, he never let cancer take away his positive outlook on life. 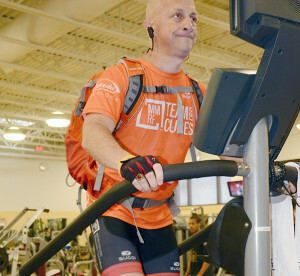 Rudman said he brought a bike and cycling trainer stand to work on his physical fitness while waiting for a stem cell transplant in August 2015. He also provided Multiple Myeloma Research Foundation jerseys and bracelets to patients and hospital staff between treatments. Retired Lt. Col. Gary Rudman, the U.S. Air Forces Central Command Safety deputy director, uses a stair machine at Shaw Air Force Base, S.C., Dec. 14, 2016. Rudman is conditioning his body to prepare for his climb up Mount Kilimanjaro, Tanzania, in February. He heard two words he wasn’t expecting Aug. 28, 2015 — complete remission. Although multiple myeloma is an incurable cancer of the plasma cells in the bone marrow and will inevitably return, he said he has never let the illness prevent him from doing what he enjoys most — helping others — something he and Robin are determined to do. “We put our heart and soul into fundraising efforts to raise money so people like me and (those) in the future gain the benefits,” Rudman said.